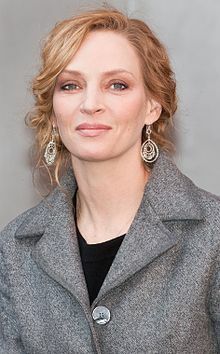 Uma Karuna Thurman (born April 29, 1970 in Boston, Massachusetts - zodiac sign Taurus) is an American actress and model. She has performed in leading roles in a variety of films, ranging from romantic comedies and dramas to science fiction and action movies. She has been nominated for an Academy Award and has won a Golden Globe Award . Her most notable roles include Mia Wallace in Quentin Tarantino 's Pulp Fiction (1994), Debby Miller in the HBO miniseries Hysterical Blindness (2002), and Beatrix Kiddo in Tarantino's Kill Bill films (2003/2004).